Posted November 21st, 2012 by David Porter & filed under Hot Topics, MailBigFile, Social. Will 2020 see the first truly virtual Olympic Games? Many people love predictions, what-if fantasies and prophecies about how things will be in the future. With technology, the guessing game has never been harder. International IT service specialist, Atos, who partnered with the Olympic and Paralympic Games 2012, produced ‘ascent thought leadership’ making some assertions and prognostications about what sport and technology will look like for the Olympics of 2020. They felt changes from the home watching perspective will arrive from the inevitable merging of live footage and gaming. Fans will ‘step virtually onto the pitch’ to compete themselves. 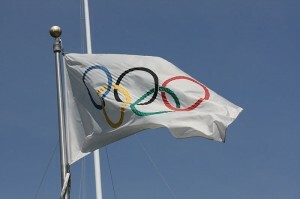 They will recreate achievements of past athletic heroes virtually, and again, compete with them. Speedometers and a range of statistics will be enhanced, so every facet is available at a touch or point on as many screens as people want to use. Competitive action will be followed at home as if through the eyes of the athlete, enabling viewers to ‘be his or her own director’, choosing which slice of the action to watch. Atos said that fans watching in actuality ‘will be more involved in the action’. There will be more feeding the audience information, data and trivia that may not be broadcast outside. Second or third screens alongside each seat will ‘secure a front row view from every seat’. Queuing and problems of ordering tickets will evaporate with real time, cash-free booking, entering/leaving venues and buying refreshments and merchandise. This one seems a natural progression that may be applicable in all forms of spectator entertainment long before 2020. The instant sharing/commenting on events that is beginning to become a way of life is not going to diminish soon. The 2020 Olympics will be driven almost entirely by the cloud, which will make sharing of data and views commonplace and on a scale never before seen. According to the technological forecasting by Atos, the smarter training that is gaining momentum through comparative data, will be standard practice. Patterns, errors, weaknesses and potential injuries will be flagged up in training monitoring. They also suggest that smart-clothing will be the norm, with performance improvements and real-time information informing even during races and events. Analysis of fan-based social media will also permit real-time changes in advertising and sponsorship, which will be financially attractive to the successful of appealing, if increasingly annoying to those who just want to watch and enjoy sports. Perhaps the biggest change that technology will bring is the opportunity to stage virtual games. The same race, run simultaneously, but in different countries. Athletes would appear to be together on a track, but in fact would not be. Holograms, avatars or whatever will be brought together! That would change everything. Travel, accommodation, the sports fraternity’s social world and the benefits of different nationalities mixing together in common effort. Could it be that cost finally determines the approval of the first truly technologically-innovative games in 2020 or soon after?